Thank you for your trust in our company and for buying the new Energy Earphones Sport 1 Bluetooth. We hope you enjoy your new earphones. Bluetooth earphones for all sport lovers. Great sound and functionality. You can answer your calls and control your music while you are training. All this with perfect fit thanks to their secure-fit system. 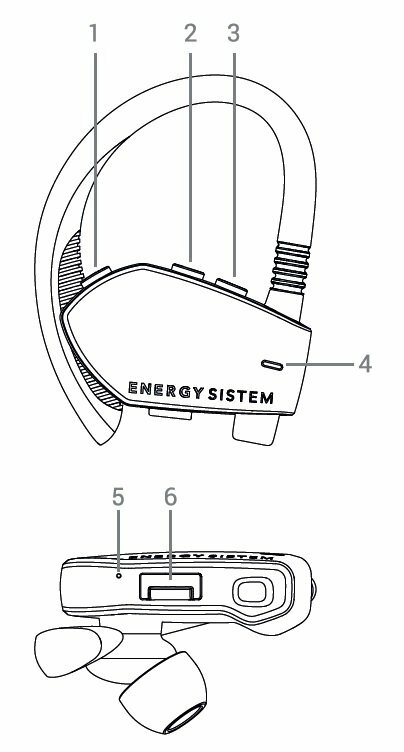 We recommend you to read this manual and familiarize yourself with it before you start using your Energy Earphones Sport 1 Bluetooth. Do not expose your Energy Earphones Sport 1 Bluetooth to impacts, dust, humidity or high temperatures. Do not dismantle the device. All reparation works should be carried out exclusively by qualified staff of Energy Sistem Technology, S.A. Please make sure that your Energy Earphones Sport 1 Bluetooth are turned off when you are not using them and do not store them with an empty battery for long periods of time. Maximum output power: 5.62 dBm. To turn on your device, press and hold the MULTIFUNCTION BUTTON (1) for 2 seconds and the INDICATOR (4) will light in blue. When switching on the device, you will hear a confirmation sound. When the device is on, the INDICATOR (4) will keep flashing blue. To turn off your device, press and hold the MULTIFUNCTION BUTTON (1) for 3 seconds. You will hear a sound when turning off the device. When the battery level is below 10%, the INDICATOR (4) will flash red and you will hear a sound to remind you to charge the battery through the CHARGING CONNECTION (6). Connect the mini USB end of the included USB cable to the CHARGING CONNECTION (6) and the other USB end to any device with an USB charging port to provide energy (PC, USB wall charger, car charger, etc) to charge the battery. The INDICATOR (4) lights in red while charging the battery and turns blue once the charging process is completed. Important: We recommend not to leave your Energy Earphones Sport 1 Bluetooth unused for long periods of time with an empty battery. We advise to charge your earphones' battery at least once a month. 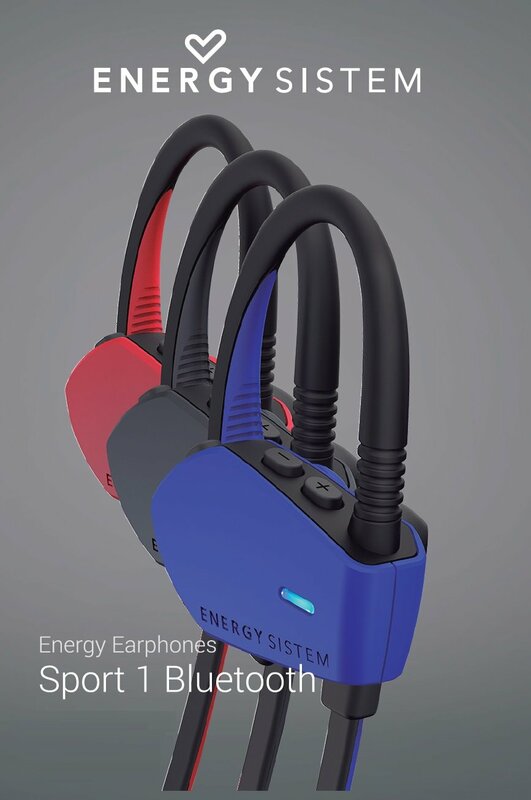 Turn off your Energy Earphones Sport 1 Bluetooth and press the MULTIFUNCTION BUTTON (1) for approximately 4 seconds, until the INDICATOR (4) starts flashing blue and red. At this point, you will be able to pair your earphones with your smartphone or tablet. Once your Energy Sport earphones have been detected, press "connect". The devices will be connected immediately and without codes. You will hear a sound that confirms that both devices have been paired. Press the VOLUME + (3) or VOLUME - (2) buttons to adjust the playback volume. You will hear a beep when reaching the maximum and minimum volume levels. Press the MULTIFUNCTION (1) button to pause or resume playback. Press the NEXT (3) or BACK (2) buttons for 2 seconds in order to switch to the next or previous track. You will be able to control your calls from your earphones if you pair your Energy Earphones Sport 1 Bluetooth with your mobile phone. You can answer a call by pressing the MULTIFUNCTION (1), VOLUME - (2) or VOLUME + (3) button once. Press the MULTIFUNCTION (1) button once to end a call. Press twice the MULTIFUNCTION (1) button to dial the last telephone number in your smartphone's call log. Press the MULTIFUNCTION (1) button for approximately 2 seconds to reject an incoming call. Energy Sistem Technology, S.A. is liable for any lack of conformity that exists at the time the goods are purchased during a period of 36 months. Batteries are excluded from the 36-month warranty, having a warranty period of 24 months. This warranty covers any defects in workmanship or materials. This warranty does not cover any product failure due to accidents, misuse or alteration made by an unauthorized person. The special 36-month warranty is valid for the European Union. For other countries please refer to the specific legislation or your local distributor. Please visit http://www.energysistem.com/en/support and select your product to view the FAQ (Frequently Asked Questions), user manual, quick guide, drivers and updates available, submit a query to Technical Support Service or manage the warranty. Alternatively, you may prefer to contact the distributor that sold the product by presenting the purchase receipt or invoice. Important: This warranty does not cover any damage or loss of data stored in warranty products. Therefore, Technical Service of Energy Sistem Technology, S.A. will not assume any loss of the above mentioned information. In this respect it is recommended that you make a backup of your data and remove any personal data from the product's internal memory before you send it or send the device with the original data only. ©2015 by Energy Sistem®. All rights reserved. is in compliance with the essential norms and standards of the Directive 2014/53/UE of the European Parliament and of the Council of May 06th 2016.